Fujitsu announced it is providing a full-scale RFID solution at several BEAMS retail outlets to streamline its operations, from the back-office at the company’s headquarters to the front lines of its retail stores. 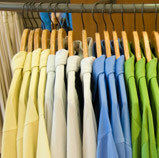 Fujitsu RFID tags are attached to each article of clothing and used to manage merchandise at every stage of its life cycle, from shipping to stocking and sales. Each shipping box, hanger, block of display racks, and shopping cart at checkout can be simultaneously read using a RFID reader/writer, making it is possible to improve the efficiency of work performed by employees. Integration with the store’s point-of-sale (POS) system also allow product tags to be scanned simultaneously, reducing time required by BEAMS staff during checkout, while boosting convenience for customers. BEAMS has deployed the new system at two stores that opened in September and plans to implement the system at three additional locations scheduled to open this year.